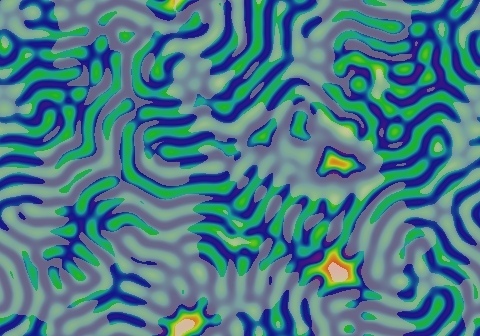 These images and movie demonstrate the behavior of the Gray-Scott reaction-diffusion system with σ=Du/Dv=2 and parameters F=0.0220, k=0.0510. Spots grow with smooth outer edges, then after colliding proto-spirals appear briefly inside. 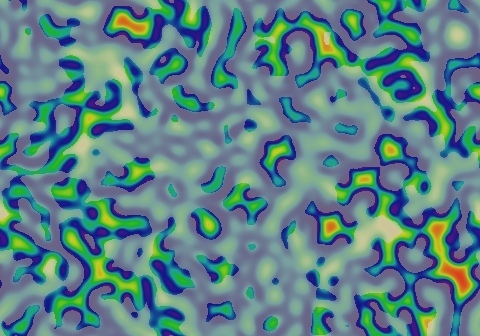 The system then passes through a phase resembling the area directly to the west, but a pattern of recognizable negative stripes and spots emerges by about the 2500 tu. Oscillation continues indefinitely, and small areas periodically revert to the red state briefly. When this happens a small region of the stripes/spots pattern is rebuilt; through such events the pattern evolves towards many straight parallel stripes at 60o and 120o angles.